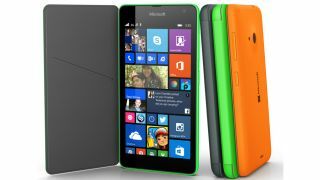 The first Lumia bearing Microsoft's name has officially been revealed as the mid-range 5-inch Microsoft Lumia 535. Instantly recognisable as a Lumia, the 535 boasts a quad-core 1.2GHz processor backed by 1GB RAM and 5MP cameras on both the front and the back. The display is a qHD (960 x 540) affair while the plastic chassis comes in the bright array of colours usually associated with Lumias. There's blue, orange, green and black to choose from. It runs Windows Phone 8.1 and is clearly aimed as an affordable, entry-level device. A UK/US release date hasn't been announced yet with Microsoft prioritising China, Hong Kong and Bangladesh, although Microsoft has said the UK should expect the Lumia 535 in Q1 of 2015. When it comes to pricing, Microsoft has slapped an RRP of €110 (around £86, $136, AU$159) on the new device, although retailers and networks may alter this on release. Along with the low cost of the device, Microsoft is hoping that its homegrown software will sway potential customers. The Lumia 535 comes with five integrated Microsoft services: Skype, Office, OneDrive, Cortana and OneNote. Of course, all these - bar Cortana - can be had on iOS and Android as well. Interestingly, Microsoft has given the Lumia 535 a fair bit of connectivity in the form of both microSD support and by creating a dual-SIM version. The former is pretty much a necessity though, as the device will only come with 8GB of native storage. Microsoft is clearly avoiding a head-on clash with flagship smartphones like the iPhone 6 or Samsung Galaxy S5, preferring instead to grow the Windows Phone user base with affordable devices. It's a tactic that served Nokia well and helped to get Microsoft's mobile OS a foothold in the market. We won't know for sure how competant the Microsoft Lumia 535 is until we get it in for a full review, so stay tuned to find out our thoughts. In the meantime, Microsoft says it'll begin launching the device in selected markets in November. Here's what we'd like to see from the Microsoft Surface 3.